Sky Bet launches a new content partnership series, produced with Sky Sports and Football Daily. In a seven-figure deal with Sky Media and Diagonal View, the investment is one of the largest brand partnership deals on social media in the UK ever. The live watch-along series, available on Soccer AM’s and Football Daily’s Facebook and YouTube channels, will air from 2:45-5:15pm every footballing week beginning 10th of August and will run until the last match of the season. Adam Smith, Soccer AM host, will anchor the show with presenters from Football Daily, like Chris Hamill and Joe Tomlinson, contributing as well. Football fans will also get the inside scoop from ex-footballers joining the show to share their insight. The playful and entertaining show will dissect football news happening live across all divisions in the UK to give fans an unparalleled view of the sport. Reacting in the moment, the show will share latest betting odds with expert analysis from the programme’s pundits. The 33-week long partnership comes as a result of an impressive campaign during the World Cup that featured football legends like Emile Heskey. In a similar format, across eight live streamed shows, it reached 2.5 million views across Facebook, Twitter, Instagram and VoD. The content proved a success for engaging second screening audiences as half of YouTube views came from mobile devices. The strategy was created to engage this mobile-first and increasingly dual-screening group of millennials in an authentic way. Even the set design has been crafted to reflect this authenticity, ensuring it has a distinct look that differs from traditional sports broadcasting. 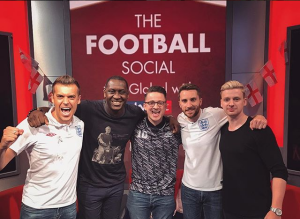 Combined, the social channels of Soccer AM and Football Daily have a following of over nine million.